A QR Code or Quick Response code is a mufti-dimensional code that is scanned into a smart phone to give the user instant access to information. Embedded within the code are links to pages on the website designed to inform, reward and motivate our customers. Unlike static codes, this dynamic code can be re-programmed for multiples uses. When you see the Alabama-Organics QR code on our marketing materials such as business cards, magazine or newspaper ads, flyers, catalogs, etc., you have a quick way to keep up with us. Just take a picture of the QR with your SmartPhone, (Sorry, dumb phones won't work) and push the button it offers you. Quick Response Codes allow us to tailor our website to serve you better. If you would like to offer youu customers a system like ours, keep on reading. At only $49.95 per year, this makes a lot of sense. What Do You See On The Phone? 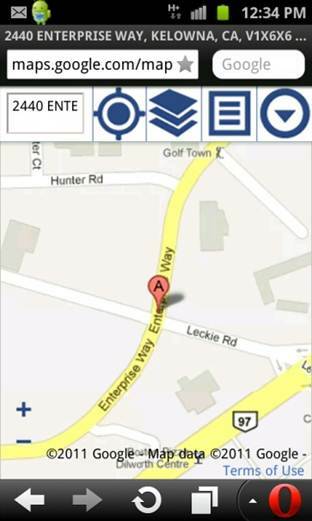 For example, you can use your phone to pull up our phone number, send us an email or find a Google map to the store. By having your own code, you can replace the corporate profile with your local maps, phone numbers, email, facebook and a myriad of other choices. There has been an increase of 1200% of people that have scanned at least one QR Code last year! Make your contact information super easily accessible to your customers using a QR Code! The revolutionary QR.Get Linked! system creates a small trackable QR code that is linked to an automatically generated Mobile Website. It is a one stop solution that has all you need to get started with QR Codes. The QR Code is linked to information in your user profile which you can change 24/7 while your QR Code always stays the same! You can add your QR Code to your business card, most phones can still scan it when it is as small as only 8 by 8 millimeters! The data in your QR Code is as small as technically possible because of our unique small domain name: QR.GL! QR.GL recommends using the free Scanlife app to scan QR codes. These QR Codes let your customers simply point and shoot to have any information you want to present them! All you need to do is click on the QR Code generated for you to save it on your computer. Your printing company will be able to use this file to include in your marketing materials or business card. Get more customers by making it convenient and easy to contact your business! At only $49.95 this just makes sense. Get Yours Now! The QR.GL Propack statistics screen reveals the locations where your QR Code was scanned. To avoid privacy issues, the QR.GL system is permission based. The locations are based on cell tower triangulation or GPS information from the user’s phone and is usually very accurate. You can scroll, drag and zoom the map to see the location markers. Multiple markers in one place are clustered for enhanced readability. Clusters automatically expand when clicked on or zoomed in. Soon to come: The Statistics page of the Propack will start recording which buttons your users actually pressed on your mobile landing page. More graphs will be provided to measure the effectiveness of your mobile QR campaign. Many new features will become automatically available to Pro QR accounts in the near future. The standard QR account will stay the way it currently is. You can upgrade at any time. Create mobile coupons with just a few clicks of your mouse! Based on the easy ‘edit profile’ menu for your mobile landing page, we introduced our Mobile Coupon Generator. The coupon comes with its own selectable hotbutton for easy access via the mobile landing page. Automatic barcode generator to create Code39 or UPC barcodes for your coupon. Color selectors for all texts, graphics, starburst, scissors and background. User selectable uploadable logoimage, auto resizing. The mobile coupon comes with a full set of social media share buttons on its mobile landing page (all included). Only $99.90 per year, or upgrade from a standard account for $49.95! Why choose the QR.GL System over one of the free QR code generators out there? All of these amazing features can be yours with your own customized, brandable and trackable Get Linked QR Code System for only $49.95 per year! You can earn affiliate income promoting the Get Linked QR System. Get 3 QR Codes activated and yours is FREE plus a $10.00 Bonus. Get Full details.